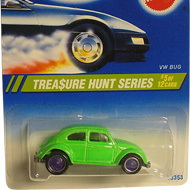 4/12 from the 1995 Treasure Hunt series. 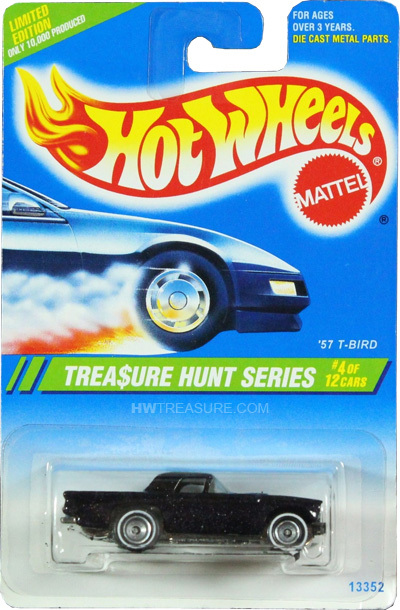 The T-Bird has metalflake black paint, clear windows, clear interior, white line Deep Dish Real Rider wheels, and a chrome plastic Malaysia base. The Thunderbird first appeared in the 1978 Flying Colors series. It is one of three ’57 T-Bird castings and originally had porthole windows just like the actual vehicle. 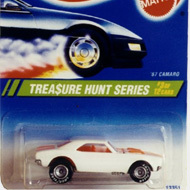 This popular car once again returned as a T-Hunt in 2000.